This spectacular purse frame is a very rare example of a scarcely known kind of object. It’s the clasp for a purse used by noblemen, bankers, moneychangers and merchants -rigorously men- for keeping coins, but also keys, letters and documents or the white handkerchief, an essential accessory for the adult gentleman; for sure, the purse was a status symbol for an aristocratic. It had no handle or shoulder strap but it was attached to the belt with metal hooks and worn on the right side; also, it was often coordinated with the belt buckle and the sword handle worn on the left. 1. Alessandro Allori, Portrait of Tommaso de’ Bardi, circa 1560 , Sotheby’s 2014, detail. Since the Middle Ages, the purse was a leather or velvet pouch closed by a bronze or iron clasp; slightly different purses were worn by huntsmen and pilgrims. 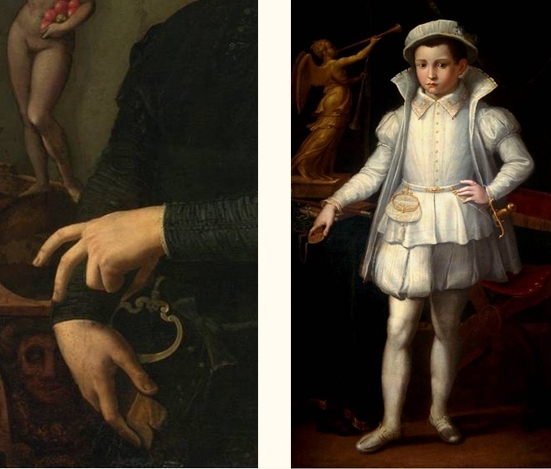 We still have many paintings and portraits of gentlemen wearing purses, but only a few frames still exist in international museums collections, some with the bag still attached. 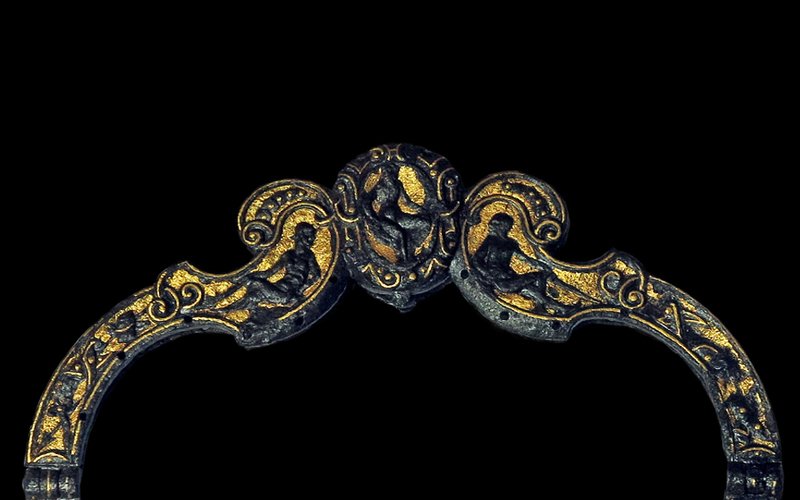 However, the Italian Renaissance iron purse mounts of remarkable quality are very few and only rarely gilded (e.g. New York, Metropolitan Museum; Cleveland, Museum of Art; Ecouen, Musée National de la Renaissance; Paris, Petit Palais; Vienna, Kunsthistorisches Museum; London, Wallace Collection). 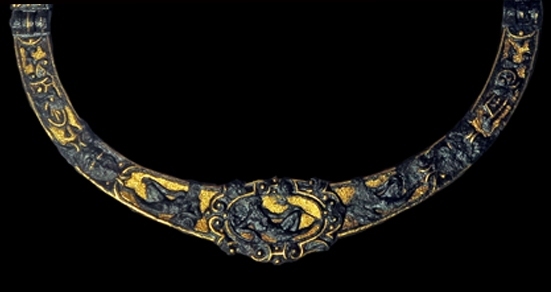 This masterpiece iron clasp shows a refined and complex decoration on the front: the lower half presenting in the center the long-bearded Neptune holding the trident, laying within an oval frame adorned with scrolls and studs; Neptune is flanked by the allegories of two Rivers, represented as male figures resting on a jar; all the figures stand out against a golden background; the other parts of the mount are adorned with a pair of winged masks and intertwined scrolls; in the centre of the upper half there is another triad of figures: in the middle Jupiter, seated on a throne into an oval frame, on the left Mars, in a warlike suit with helmet and sword, on the right Vulcan; the three figures are chiselled in a very low relief against the golden background and both Mars and Vulcan are framed by two richly adorned scrolls; the descending sides have scrolls as well. The back is also decorated on the upper part with overlapping discs, volutes, interweaved geometric elements, and has some small holes used to stitch the velvet of the purse. The style and the technique are the same of the most beautiful 16th century armor suits made by the renowed Milan armourers such as Negroli, Pompeo della Cesa and Piccinino, who served the most important Italian and European families. In fact, besides the armour suits that made them so famous, Milanese armourers also produced different steel or iron luxury items, such as cabinets, mirrors, candlesticks, reliquaries, purse mounts, belts, swords hilts, horse bits, stirrups, saddles and powder flasks. About the real existence of the legendary damascener Martino Ghinelli there is no proof, but two main specialized workshops are known: the one belonging to Giovan Battista Panzeri, called the Sarabaglia (Milan, about 1517-1587), who was the brilliant pupil of Filippo Negroli and worked for Ferdinando Duca d’Aosta, Philip II of Spain and the dukes of Mantua; and the workshop of Giovanni Antonio Polacini called Romerio or Romé (around 1527- between 1595 and 1602). A couple of purse mounts, that must have been similar to the present one, appear in the inventory of a company lead by Panzeri and Marco Antonio Fava, another important iron master (see S. Leydi 2016). The Milanese craftsmen achieved the highest levels in the art of ironworking. 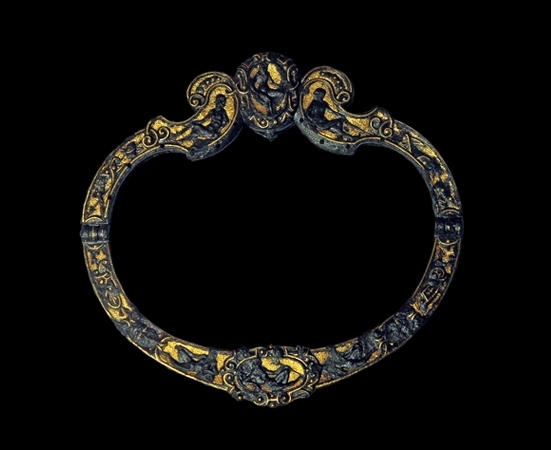 Their techniques, such as iron micro-sculpture, were used only in very rare cases for civil objects, such as this extraordinary Renaissance clasp, a work further embellished by the rare combined presence of both gilding and damascening (the complex decorative art of inlaying threads of precious metal into a dark metal background). The surprisingly well preserved gliding is an element of further rarity of the present piece. The very high quality of this purse mount, the great technical difficulty necessary to make it and the presence of male divinities suggest it may have been made for an important, wealthy man, perhaps linked to the maritime world for privileges or economic activities. The richness of the decoration, typical of late Mannerism, allows to date the piece between the middle and the third quarter of the sixteenth century. References: La collection Spitzer: Antiquité, Moyen-age, Renaissance, Paris, Maison Quantin 1891, tome 3, p. 47, n° 20; Henri-René d’ Allemagne, Ferronerie ancienne, Catalogue du Musée Le Secq des Tournelles à Rouen, 2 voll. Schemitt, Paris 1924 (English version: Decorative antique ironwork, Dover Publ., New York 1968), plate 250; M. Delpierre, Indispensables accessoires, XVIe – XXe siècle, exh. cat. (Paris, Musée de la Mode et du Costume, 8 december 1983 – 23 april 1984, Palais Galliera), Paris 1983, p. 57, cat. 362-382 ; S. Leydi, Mobili milanesi in acciaio e metalli preziosi nell’età del Manierismo, in Fatto in Italia, dal Medioevo al Made in Italy, exh. cat. (Turin, Venaria Reale, 19 march – 10 july 2016, ed by A. Guerrini), Milan 2016, p. 121-137.